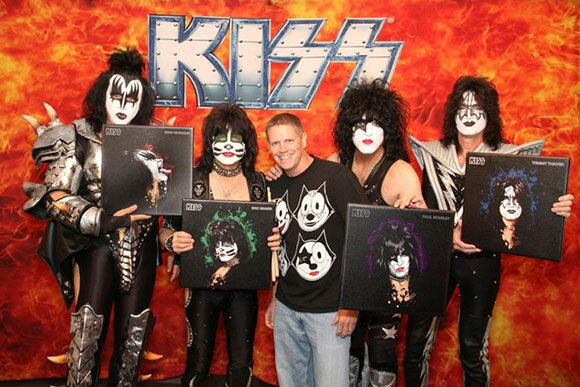 Notes: In 2012 I was given the opportunity to fulfill a childhood dream and meet KISS. 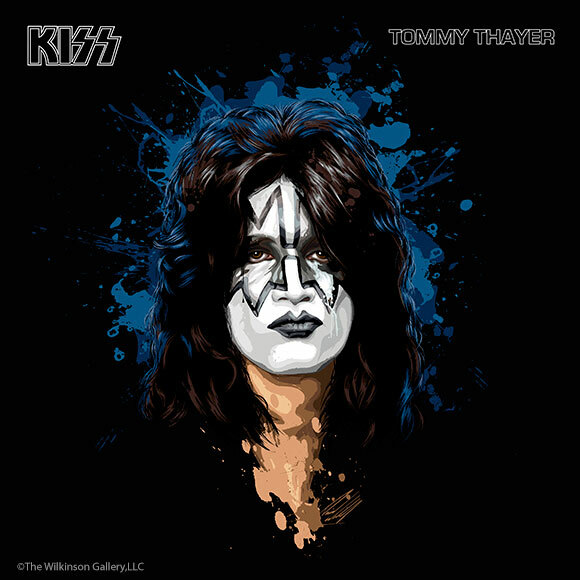 The images of the four current members (Gene Simmons, Paul Stanley, Eric Singer and Tommy Thayer) were created as gifts which were presented to them on Sept 19, 2012. 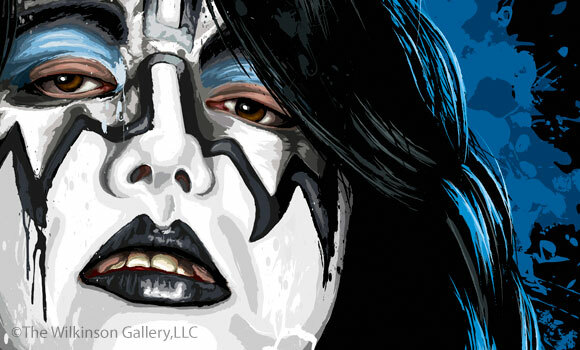 After the event, I wanted to pay the same artistic respect to all the other members who wore makeup throughout KISStory. 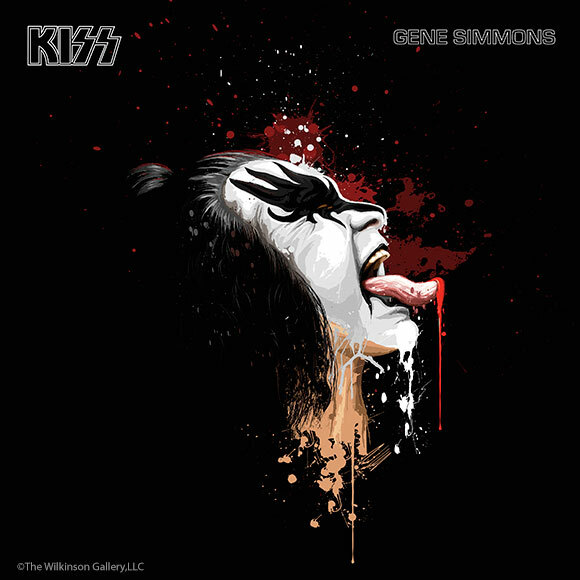 You can read more about my experience and Gene's amazing reaction to my work in my blog post Kiss and Tell. Received my six prints of gene paul peter ace and eric carr and vinnie vincent.They are all ready hanging on my wall.I love these prints goes great with me and my wife kiss collection thank you very much. Thank you so much for commenting and letting me know. Very glad to hear that you are happy with them. Please spread the good word! Ya know. You are not the first person to mention that. To tell you the truth I chose that view for no other reason than that was where I started experimenting. When I did I had no plans on doing an entire series so having it match something else was not really even a consideration. It just kind of evolved from there. Having them look like the ’78 solo albums was not something I had planned either. I just filled my creative intuition. I think I may have to do another view but let me ask you this. Does having two different Gene’s muddy the collection / message? For instance right now it is a defined collection which people seem to like. By adding another view to the mix does it confuse the issue? I think there are several ways to look at it from a collector’s point of view and a seller’s point of view. The collector wants more of everything. 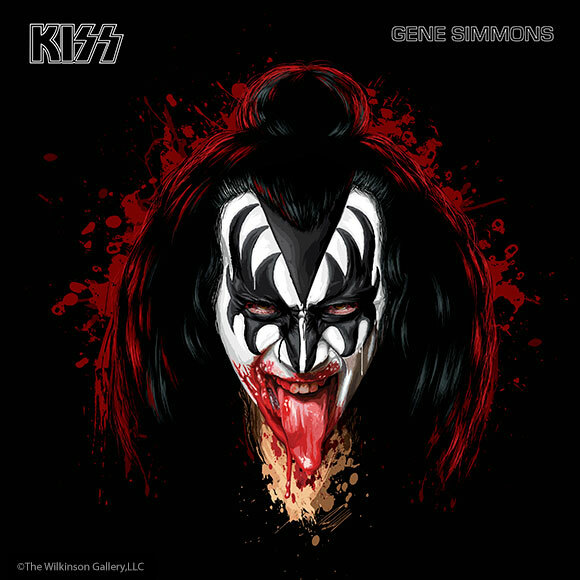 The seller wants to sell and having a different option for Gene Simmons may hurt the original side view. I personally would love to see what comes out of a front view using your talents. Thank you very much for the input. I think I will definitely have to do one. What I was thinking of possibly doing is once finished, pull the original from availability and only offer the new one. Another thought I thought about was doing Paul in the “bandit” makeup. 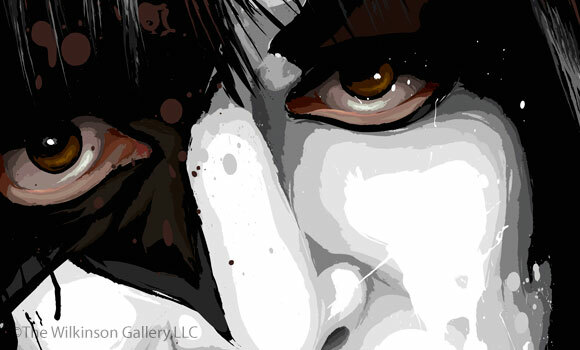 Create a true history of the makeup designs. 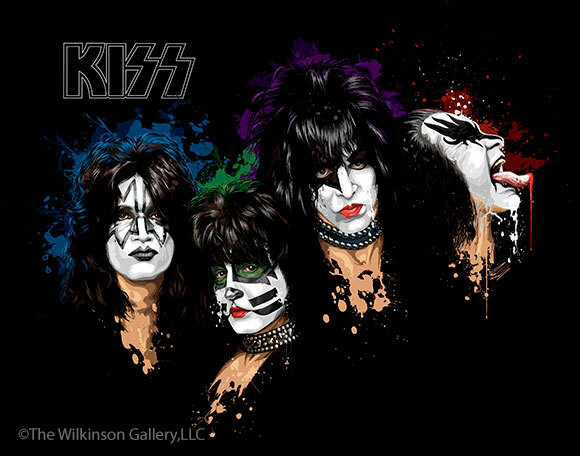 Hi, I am an artist also and love KISS. Just wanted to know if you were ever going to do a portrait of Anton Fig seeing as how he played drums on Dynasty and Unmasked? Plus what about doing the Solo Records with Ace from Frehley’s Comet? 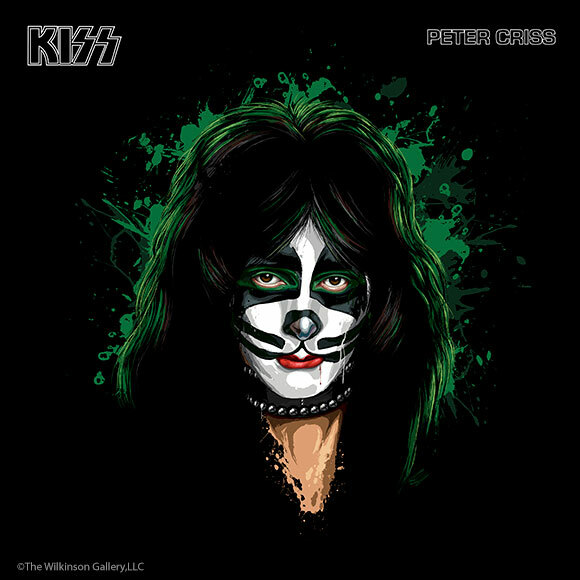 Just askin. . .Great work by the way.I really love the way you did Peter Criss alternative solo cover. From one artist to another, have a great year. . .
Hello Tim. Thanks for the comment. Always nice to meet a fellow artist. To answer your question. No that is not something I have considered. 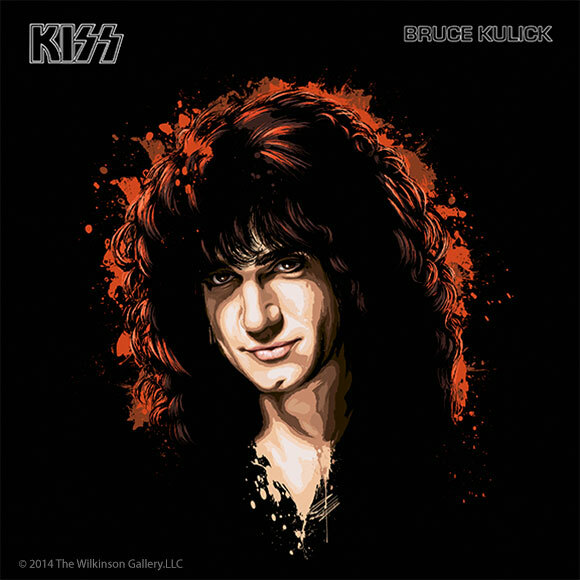 I really need to draw the line somewhere and while it has indeed moved from members in makeup to members who never wore makeup to include folks like Bruce Kulick and Mark St. John. It really opens up a can of worms when I start doing people who were never officially in the band or on stage. Who knows how many studio musicians they brought in over the years? I love these images. I’m trying to decide which and which sizes to order. Are there any plans to do something for Bruce and Mark? I have been asked by a number of people to do Mark and Bruce. It really was not something I had planned on as my focus was really about the makeup. Just seemed a member without makeup and all the drippiness would not be nearly as cool. That said I may have to reconsider. Sadly it will probably take me more time to do Mark’s than he actually spent in the band. ; P Stay Tuned. 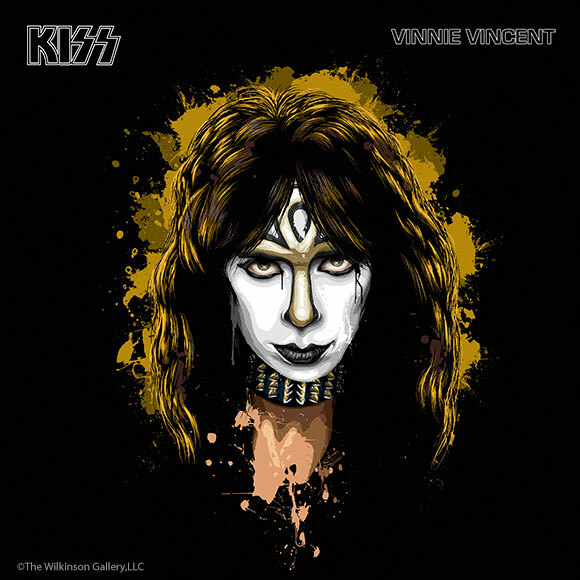 I just found out about your KISS KOLLECTION artwork prints through Google while doing a search for some Vinnie Vincent pictures in his Ankh Warrior KISS make-up. 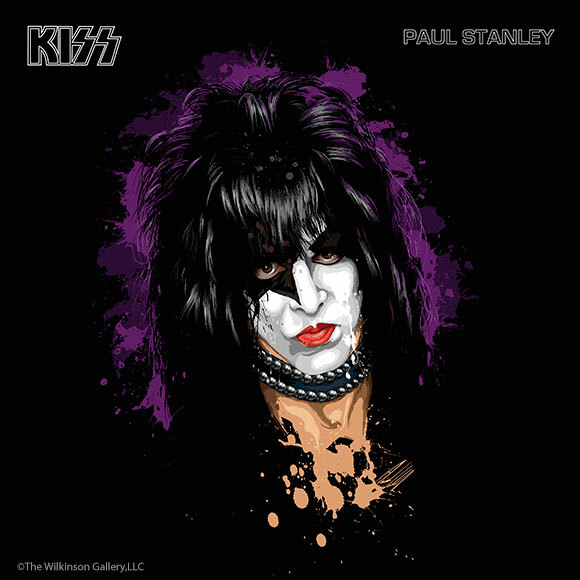 Would it be possible for you in the foreseeable future, to paint in the same style as the other KISS KOLLECTION pieces, a portrait of Paul Stanley in his early ’70’s KISS Bandit make-up ? 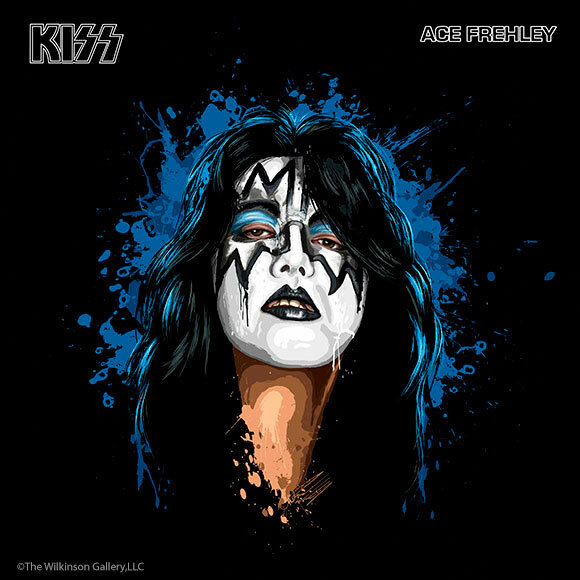 I personally think it would complement and complete the KISS KOLLECTION Series very well and it would show all the “official” KISS make-up character designs worn by all the make-up wearing members. Congratulations for your KISS KOLLECTION art pieces and thank you for making them available for collecting and for purchase !! Thank you very much for the note and the kind words. I appreciate the suggestion. 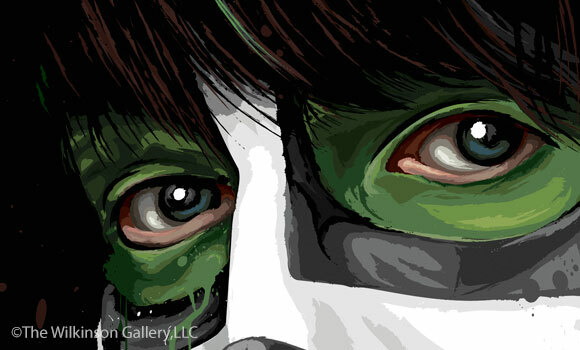 I actually already had that same idea and planned on doing a “bandit” Paul and perhaps even one of Eric Carr in his original makeup design if I am able to find decent enough reference. I will probably eventually do a set based on their designs on the first album as well. All ideas I have floating around in my head. Can’t guarantee when I will be able to get to all of this but in due time. I may have to do a “Love Gun” era Paul first however. His being the only modern version in the collection seems to now stand out a bit after I replaced Gene. Stay Tuned. 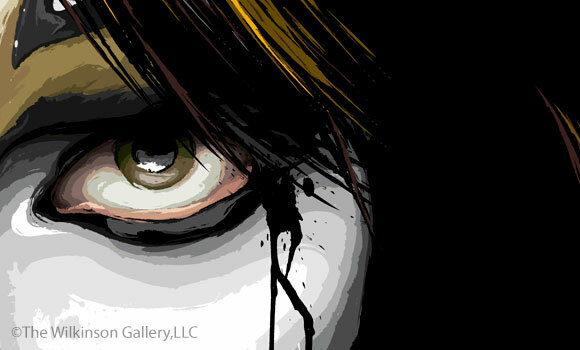 If you have not done so, please “like” my official Facebook page “The Wilkinson Gallery”. Probably the best way to stay informed. Thank you very much for visiting my site and for your comment. My initial intent was not as much creating a history of band members but more a history of makeup. That said, you are not the first to suggest that and in hindsight it does feel like an omission so I will probably eventually get around to doing Bruce and Mark. I saw on Facebook a pic that had all members of KISS in a circle. I was wondering if that was a print that was available for purchase or if it was just a rendering to show you made all the Solo pics for all members? If so, I would be very interested in purchasing. Thanks for your comment. Unfortunately due to legal / licensing restrictions that one is not currently available. It was created just as a promotional thing. I would have to take the 40th and other logos off to sell it. Well I would say take off the 40th and logos off of it. How much would it run? Would it at least still have KISS in the center or somewhere on the top or bottom? Have to give it some thought and figure it out. Seems to me it needs something in the center. Well when you get it figured out, that would make it complete. I would be all over it. Maybe make it like the Rock-N-Roll Over album cover…??? 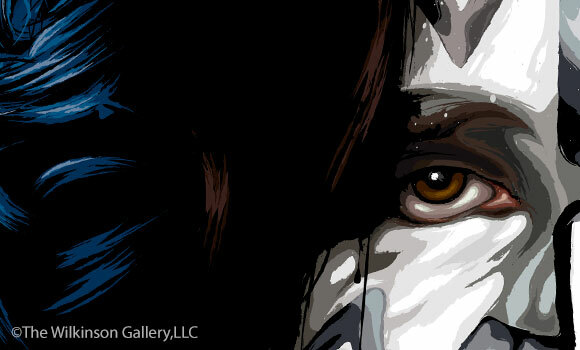 Hello David, I came across this wonderful artwork while searching for Vinnie Make-up photos. I was wondering, have you ever thought about branching out and adding a range of t-shirts featuring these images? Obviously I’m asking this with no knowledge of the licensing etc., but there are a lot of people out there who would love to buy a Vinnie make-up shirt. David, these paintings are wonderful art. 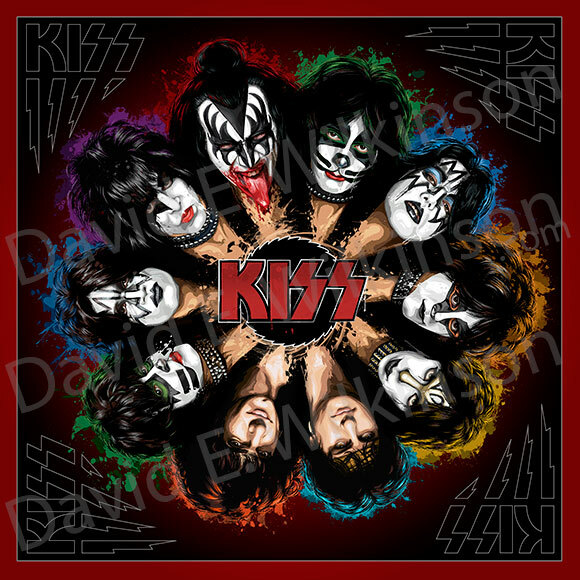 Would it be possible to buy a custom set of prints WITHOUT the KISS logo & name? My apologies for the delay in responding to your comment. Were you looking for all 10 without the logo and name? In a nutshell – I love your artwork! 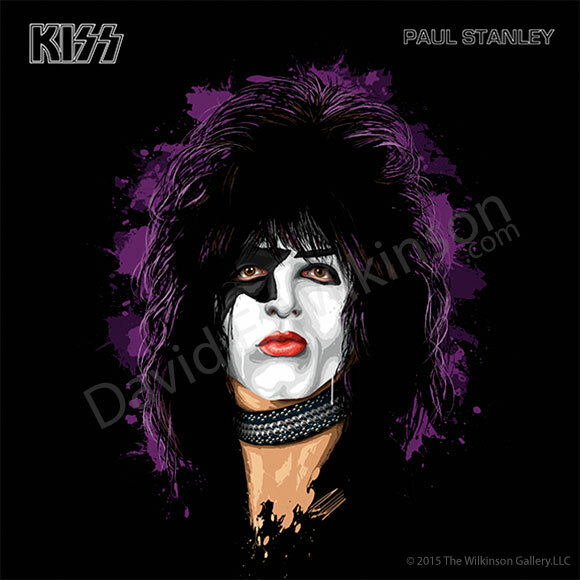 In my opinion, these paintings capture KISS much better than their original solo albums. 1. 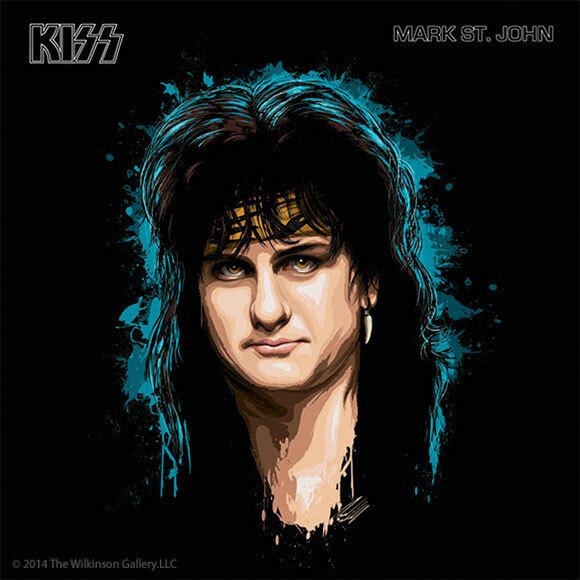 Any chance you’ll be working on a younger 1970’s Paul painting, to accompany the younger Gene portrait? Seeing a younger Gene, Ace and Peter along with an older Paul just doesn’t seem right to me. 2. 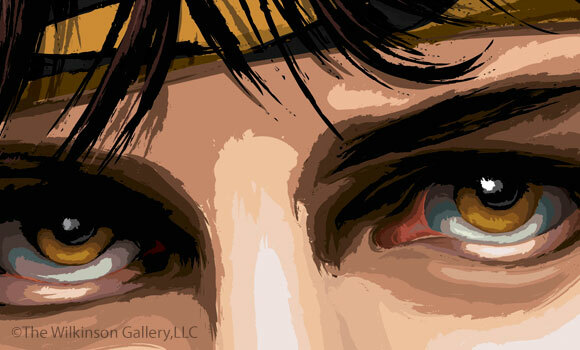 What is your take on a Paul painting in the Bandit makeup? That would be very cool to see too! 3. 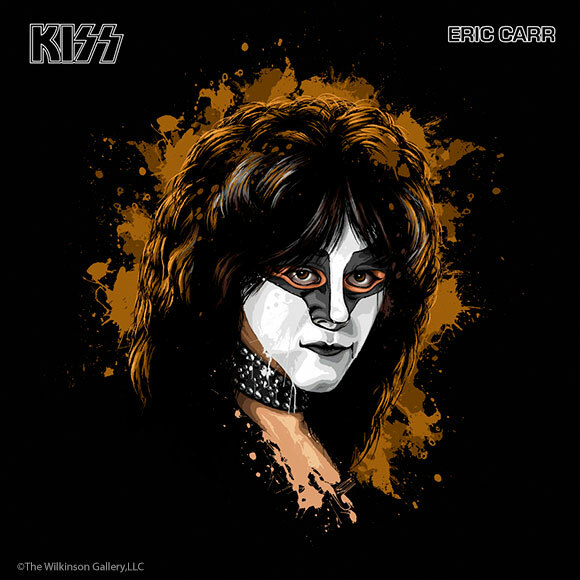 Any plans to recreate an Eric Carr with his bushier hair style? I’m certainly not being critical of the Elder haircut style painting you’ve created. I just remember Eric better with the fuller hairdo. Again, you’ve created some very amazing stuff! 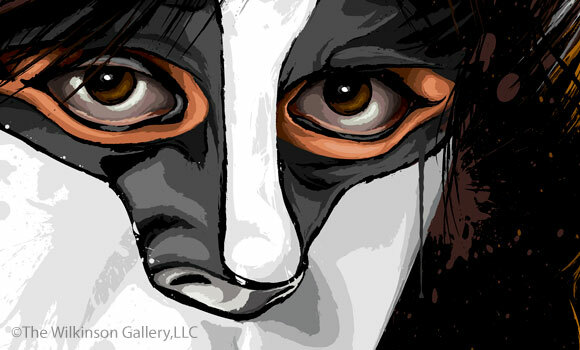 There is a multitude of territories you can always delve into (Ace & Peter without makeup, Eric Carr and Vinnie without makeup, Eric Carr in the Hawk makeup, early original makeup designs, etc.). I look forward to hopefully seeing more of your talents very soon!! Thank you so much for the comment and compliments. I hold those ’78 solo cover portraits in pretty high regard. Not sure mine compare but it means a lot to hear that some people feel they do. Definitely a compliment. I was just trying to do something different. As a fan myself I tried to create something I had not seen before and would want myself. 1. Yes. One of these days I will probably do one. Do you think one of “chubby” Paul from the original album cover is too early? 2. Yes. 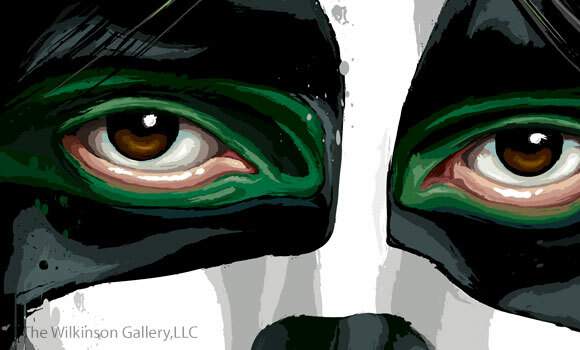 I also plan on doing a Paul in the “bandit” makeup. When? Who knows? When inspiration strikes I suppose. Have to fit them in-between paying work. 3. Have not ever considered doing a different Eric Carr for the hair style. To me the makeup is what is most important. Might eventually do one of his original makeup design but wasn’t as concerned about the hair. Paul was a bit chubbier during this time, and I think it would be a perfect look for rounding out the original band portraits. Whatever you decide, however, I’m certain that I will love it! I’m very anxious to see what you ultimately decide to do! Thank you for allowing me to share my input with you, Dave! Have you ever did the Creatures cover in your own way? No I haven’t. While I am not completely opposed to it, I like to try to do things that are a little more unique. That image is out there and is well known. If I was going to paint it I would probably try to do something different with it anyway so it wouldn’t be the same. 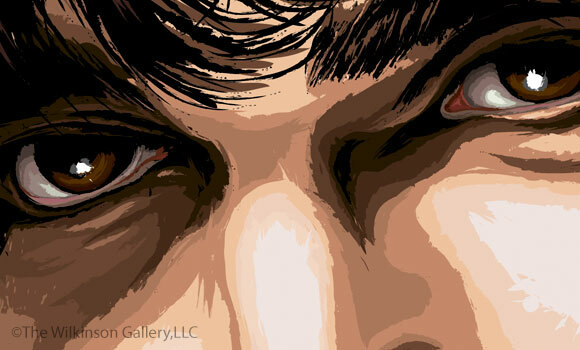 What I would like to do if I can ever get to it is a series of portraits called “The Originals” and do each founding member in their original makeup designs including Paul as “The Bandit”. Just have to fit it in-between my paying work. My name is Marcelo and I’m 21 years old, and I’m from Brazil. I’ve been a KISS fan since I was 4, probably. 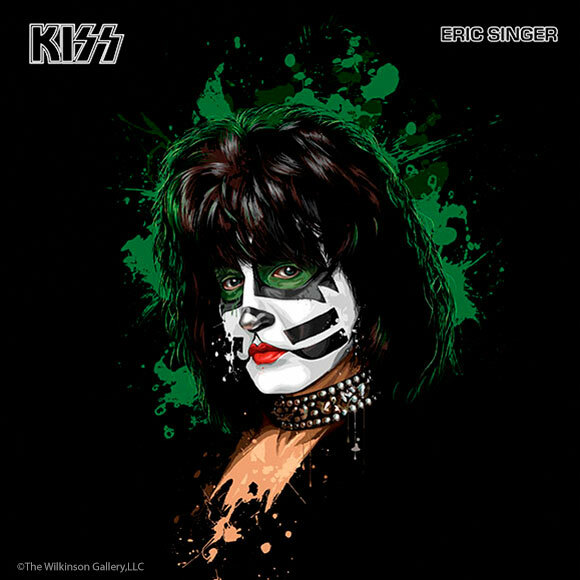 My father used to show me all the LPs and KISS stuff ( I’ve been always crazy about the action figures) when I was very young and of course this made me enjoy and love this band very much! My first KISS concert was during ALIVE 35 Tour back in 2009, I wish one day I could meet them and make a dream become a reality! I really loved your paintings! You are very talented and I would like to thank you for sharing them with us. Unfortunately, I am not able to buy them, but I saved the images on my computer. If you want, you can also check my band on our website and facebook pages, its name is Silver Mammoth and we’re bringin’ up a new album very soon, classic rock with influences of hard, heavy and psychodelia. Once again, Thanks for your ART! 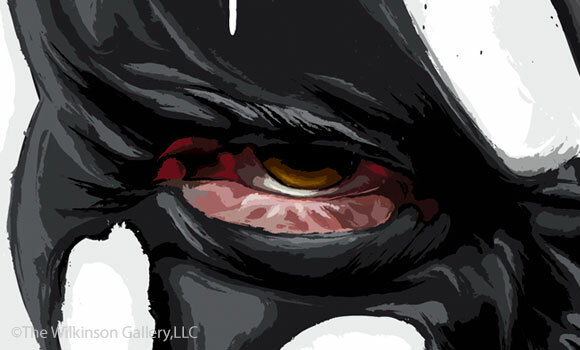 Gene is looking for you on Twitter. No idea what he wants. Thank you for the heads up. Had no idea before you mentioned it. Thank you Matt. That was where it all started. Did that one and the fan in me said “that is really cool”. Everything else kind of grew from there. You’re the best! You’ve done a terrific job on these portraits. Saw that Gene’s been looking for you on Twitter. It could be because he wants a cut 😉 but I think he has other plans! 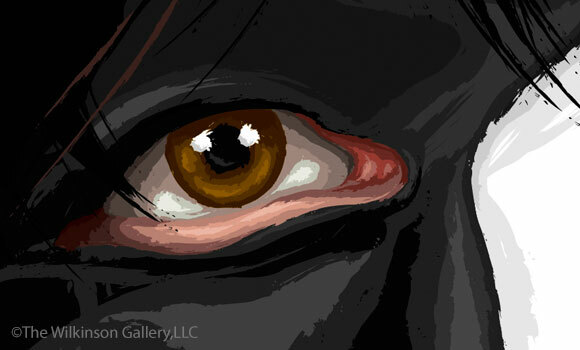 I do have a pretty cool idea myself which involves your art and might become a real collectable. Anyway, keep up the great work! Always amazed! Finding you was the greatest thing that has happened to me, artistically. So inspired! Thank you SO much Lara. That really means a lot. The greatest gift any artist can ask for is to know that his or her work has somehow touched and better yet inspired others. I am very grateful for your kind words. I was just curious, have you ever thought printing some of your protraits on to T-shirts? All of them are awesome! Thank you very much for the kind words. I really would love to but unfortunately I cannot legally sell those images on apparel or other products without proper licensing from KISS which I cannot afford. I have had plenty of other people stealing them and doing it themselves but that is another frustrating story.